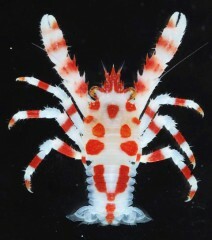 On April 17, the Okinawa Churaumi Aquarium announced that the unfamiliar galatheoidea (a superfamily of decapod crustaceans comprising some squat lobsters and porcelain crabs) that they found is a new species of galathea, or squat lobster. The staff member of the aquarium who discovered the new galatheoidea, Takuo Higashiji, and a researcher carried out a joint study and posted an article on it in an academic journal about zoological classification. Using the word chura, which means beautiful in Uchinaguchi, they named it Galathea Chura after its beautiful body, which is white with red spots. Galathea Chura is only about 15 millimeters long. Last July, about one kilometer from the coast in Onna, Higashiji found the specimen when he was collecting creatures for display using an unmanned submersible on the seafloor at a depth of 188 meters. Galatheoidea is closely related to the hermit crab. To date 19 species of galatheoidea have been identified around the Ryukyu Islands, and so the Galathea Chura is the twentieth.